Welcome to Siberian Husky Training! Feel free to check out some the great content and resources I have on these amazing dogs. Before attempting Siberian Husky training, you should first know about the background of this wonderful breed. Huskies are a nomadic breed and were originally bred to be sled dogs. As a result, they are very strong-willed, independent and stubborn. They are friendly and gentle to everyone, including strangers and other dogs so would definitely not make good guard dogs. Because of some of these traits, Siberian Husky training can be difficult. Therefore, it’s important to understand what works best for this breed and what doesn’t. It is also important to understand what Siberian Huskies require from you before trying to train them. Because they were bred to be sled dogs, Siberian Huskies have extremely high endurance and can run for miles. This active breed won’t just settle for a daily walk or two – they require a few good runs each week. If not given enough exercise, they will resort to doing unwanted behaviors to release their pent up energy: howling, chewing, crying, digging. Because Siberian Huskies love to run, you will certainly want a good fence in your yard. They are known to be escape artists and can even dig under fences. However, don’t take their running away from you as something bad; they just like to wander a lot. Siberian Huskies will run for miles before even looking back. This is all part of sled dog behaviour – they were bred to run for miles and miles without having to look back. Just remember that a tired Husky is a good Husky. Many destructive behaviors disappear if you give your Siberian Husky sufficient exercise. 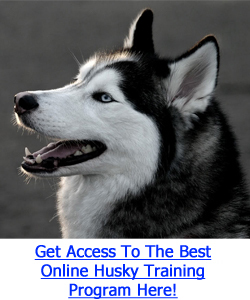 Get Access To The Best Online Husky Training Program Here! Siberian Husky training begins with a confident owner. Being equally strong-willed as your Husky is required if you want to get any commands across. You must establish yourself as alpha if you want your Husky to respect you and see you as a leader. In order to appear as the leader, you must not treat your Husky as an equal. Eat first, and then feed him. Go through doorways before him. If he is blocking your path, don’t go around him; make him move out of the way instead. Don’t allow him to sleep in your bed until he has been well trained. Siberian Huskies are especially responsive to positive reinforcement. In general, you will want to praise him for any good behavior and completely ignore the bad behaviors. Do not use negative reinforcement or harsh punishment with Huskies or they will lose their trust in you. You will want to start Siberian Husky training at as early an age as possible, so that your puppy will learn to respect you. Enrolling in an obedience class or puppy class is recommended and can be very beneficial. With this breed, it’s a matter of making them respect you as a leader and praising them for good behavior. Some of the most common problems with Siberian Huskies are howling and digging. Understand that howling is a natural form of communication in this breed and that it cannot be completely eradicated. However excessive howling may be reduced with crate training or more exercise. Digging is another behavior that may signal lack of exercise in Huskies. It can also be handled through some obedience training, by training your Husky to dig in a designated spot. Overall, lots of daily exercise, a strong sense of alpha leadership, and positive reinforcement are the keys to Siberian Husky training. If you practice these three things, your Husky will have fewer behavioral problems and grow into a wonderful, loving family pet.